"I created this recipe after having a similar cake in the cafe of a local bookstore I worked at years ago. I never forgot how delicious the dessert was, with the tartness of berries and citrus that complemented perfectly with the sweetness of the cake, the cheesecake layer, and white chocolate, so I decided to recreate it myself. The dessert from the cafe was actually mass-produced and shipped in frozen, so this is a fresh, homemade version that tastes even better than the original, if I do say so myself (haha). This elegant cake mix cheesecake stacks tart summer berries and lemon curd against creamy lime whip." Whisk 3/4 cup sugar, egg yolks, and 1 tablespoon lemon zest together in a saucepan over medium heat. Cook until sugar dissolves and mixture is light in color, about 3 minutes. Stir in 2/3 cup lemon juice and 3 tablespoons butter. Cook, whisking constantly, until lemon curd coats the back of a spoon, about 5 minutes. Remove from heat; cover and let cool. Preheat oven to 350 degrees F (175 degrees C). Coat two 9x13-inch baking pans with cooking spray and dust each with 1 teaspoon flour. Place 1 cup butter in a microwave-safe bowl; heat in the microwave until melted, 2 to 3 minutes. Mix together with graham cracker crumbs and 1/2 cup sugar. Press the crust into the bottom of 1 prepared pan. Bake in the preheated oven until slightly browned, about 10 minutes. Leave oven on. Beat cake mix, water, 3 eggs, vegetable oil, and 2 tablespoons lemon juice together in a bowl using an electric mixer until smooth. 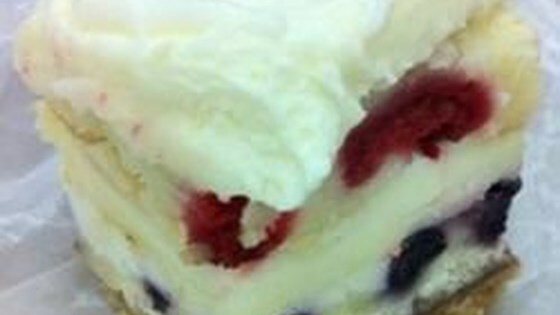 Mix in sour cream; fold in blueberries, blackberries, and raspberries. Pour 1/2 the batter on top of the crust; pour the rest into the second prepared pan. Bake the batter-filled pan in the preheated oven until a toothpick inserted into the center comes out clean, 15 to 20 minutes. Let cool. Beat cream cheese in a bowl with an electric mixer until fluffy. Beat in condensed milk until smooth and fluffy. Add lime juice and zest; mix well. Fold in whipped topping. Scatter dollops of lemon curd over every few inches of the crusted cake. Spread half the cream cheese mixture over the lemon curd. Flip the second cake onto a cake rack; gently place on top of the cheese layer. Smooth the remaining cream cheese mixture on top. Melt chocolate chips in a microwave-safe bowl in 15-second intervals, stirring after each melting, 1 to 3 minutes. Drizzle on top of the cake. Cover cake; refrigerate until chocolate and cheese layer are set, about 3 hours. You can buy a jar of lemon curd, rather than making your own. I also recently started making a raspberry sauce as garnish for this cake, and it only makes it that much better.